Specialising in Digital TV Aerials, Radio Aerials, Freesat and Satellite dish installations covering East Sussex and surrounding areas. Moonstone Aerials specialises in all aspects of Digital Television and Radio reception. It has been run by Andy since the business was established in 2004 and is based in Bexhill-on-Sea on the East Sussex coast. We can supply and install digital TV aerials to receive “free to air” television. Our radio services include FM radio aerials and Digital Audio Broadcasting (DAB) Radio. We can also install digital receivers and Satellite dishes for Sky, Freesat and European. 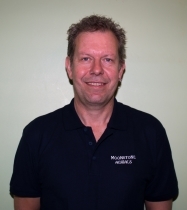 I commenced my career as a trainee Technician Apprentice with British Telecom in 1981. This involved learning about all aspects of communications and good background training for keeping up with continuous change in technology. After my apprenticeship finished I worked in a Telephone Exchange and then as a Faultsman/Jointer on the external cable network. When this position went to private contractors I left British Telecom after fifteen years of service and joined Granada as a Satellite and Aerial Engineer in West London. On Relocating to East Sussex I joined a well known Eastbourne aerial company where I worked for five years until leaving in 2004 to start up my own business. We use a Digital Spectrum Analyser Meter which gives greater accuracy and fault analysis as digital signals rely on measurements and not visual diagnosis. All estimates and advice are free and our work is fully guaranteed for a year. It is important to keep up to date with technology as it changes so quickly, therefore we are constantly researching new products and are in touch with any future developments, which in turn gives the customer the best possible service. As with most industries the aerial business will in time be regulated to reduce the amount of unqualified aerial installers. 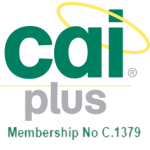 We welcome this and have become CAI Plus Installers, Freeview Approved Installers, Freesat Approved Installers and are Trading Standards Approved. 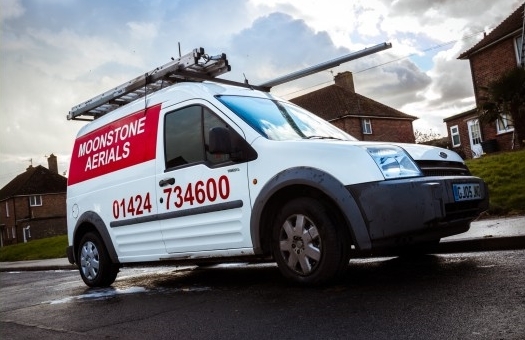 It has always been our aim to provide customers with a service we ourselves would expect to receive and believe we have achieved this, proof of which a high proportion of our work stems from recommendations. All our work is carried out with great care and attention paid to health and safety. We too offer an after care service which has proved invaluable to many customers. 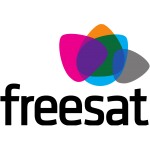 Moonstone Aerials is a member of the Confederation of Aerial Industries who are the representative body for the Aerial and Satellite industry (CAI Member No. C.1379). They expect all members to conform to their standards and Codes of Practice. Further details can be found at www.cai.org.uk. It is also a requirement of the CAI to have a minimum of £5 million Public Liability insurance of which we hold. 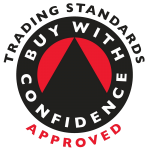 We too are members of the Trading Standards ” Buy With Confidence” scheme. All of the above means that you the customer are guaranteed a safe, honest and reliable service. More can be found out on the relevant links above.